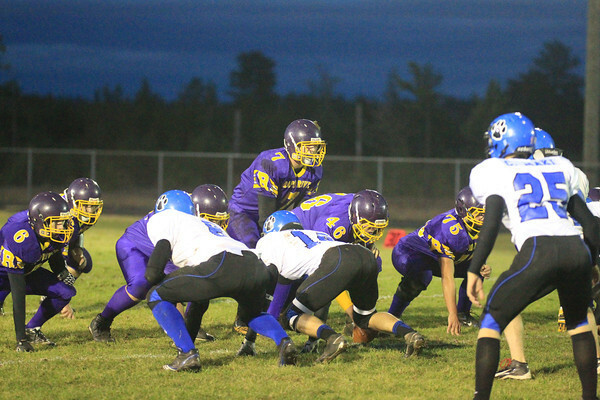 High School Football in the Upper Peninsula is the popular sport and when the practice season kicks off, the fans and the players get excited for another season. After working a long night on the weekend, it got even longer but it was worth everything I had ever imagined. Westwood High School had it’s annual midnight practice that Monday morning and I went to the high school to get some footage and talk to the coaches and players. It was wet and soggy but it got my photographer juices going and I was able to use a lot of new techniques to enhance the video for the viewer at home and get a closer look. The players had never seen a camera guy get close and personal with the action but they appreciated it afterwards with all the tight shots and different angles when watching it. Coming out of that practice, I felt pretty good about shooting another one. I went to Kingsford High School one day and I shot the Flivvers practice and my camera work got better. The emotional shots I got, the tight shots of the football and the players completing the drills were crisp and fast. I even got my foot caught under the lineman bull rush machine. It hurt, but it was well worth it. The video even has over 1,000 views on YouTube. 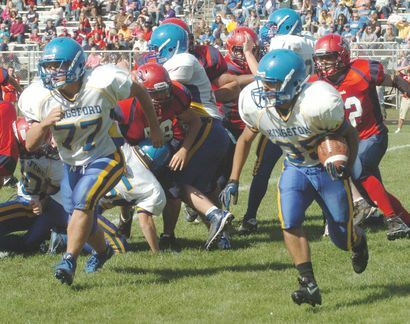 One of the best shots I ever got was the first 4 seconds of Kingsford practice. The player is looking straight at my camera and is waiting on the snap count to finish the drill. When the coach said hike, I zoomed out fast and got the players running under the lineman bars to complete the drill. The emotion I captured in those 4 seconds is breathtaking and is one of the best pieces of photography I have ever captured. It was like you could see through the players eyes and understand what he was feeling at that moment. Video like that is hard to get and watching it in the editing booth but a smile on my face. I am so proud of that moment and those two days of shooting football practice because it turned me into an excellent cameraman who could shoot and edit like a true professional. I will always remember those practices, they were awesome. I have been up and down with continuing my countdown on my blog with the top Upper Peninsula moments and I guess that is how the Tri-City North Stars felt on June 24th, 2012. Starting left handed pitcher for the Marinette Redbirds, Aaron Woods (Menominee, MI native and Saginaw Valley State baseball player) took the mound that day against the Tri-City North Stars and must have felt like Roger Clemens or Kerry Wood. Once the first pitch was thrown, he began to mow down hitters looking and swinging at his fastball, struck out the side in multiple innings, and controlled the strike zone with ease for the umpire behind the dish. To strikeout 21 batters is impressive but to do it in his 4th straight start is amazing. That was the first 20 strikeout game I have ever witnessed from little league to major league and I can’t say I have seen anyone dominate the hitters like I saw #41 do out on the mound. His delivery was very smooth and the life on his pitches were exceptional. He used great deception as a left hander of hiding his pitches until the last moment so his opponents couldn’t pick up the pitch until it left his hand. He had success as a reliever the past few seasons in college and I can understand why he did so well. Mr. Woods, after only working one week on the job, you surprised me with a pitching performance I will never forget. As a huge baseball fan I will never forget your 21 K performance in Ishpeming that Sunday. Top 31 Moments in the UP! #22 – Remarkable catch caught on camera! Being a camera man and shooting at any sporting event is fun. But shooting High school football is a real treat. When I first started out shooting with the big, Panasonic DVC Pro Tape camera it was tough to follow the football through the air. But after a while, I truly got the hang of it and captured one of the more remarkable catches I have ever seen through a lens. Ishpeming was playing Pewamo-Westphalia in the Division 7 Semifinal game at the Superior Dome with the hopes of traveling to Ford Field for a chance at the state title. But the Hematites had to go to through the Pirates first on November 17, 2012. The Hematites pulled out the victory 8-7 thanks to some great defense but that wasn’t the key memory for me. The memory was capturing the Pirates only touchdown. In the first quarter, from the Pirates own four yard line, junior quarterback Kyle Nurenberg fired a pass which deflected off Ishpeming’s Tyrus Millimaki and into the hands of 6-foot-6 junior wide receiver Lane Simon for a 94-yard touchdown and a 7-0 lead. 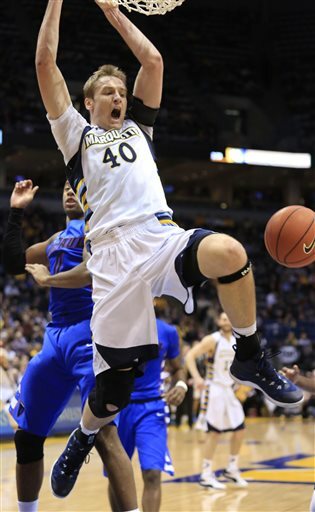 While Simon was streaking down the sideline, I got run over by the team cheering and jumping all over the place. I was cheering inside too because I was able to capture that amazing play on tape which is so hard to do in this industry. During halftime, my colleague at the time Mike Ludlum said, “Did you get the touchdown?” I said, “I sure did. Perfectly!” Even our competition didn’t get the catch on camera. That was an awesome feeling! I still watch the play from time to time just to remind myself how much I love shooting football and how I am proud of what I do for a living. Capturing that one moment may not be the difference in the world for the Ishpeming faithful, but I know people from downstate sure appreciated the great camera work I displayed that day on the sideline. 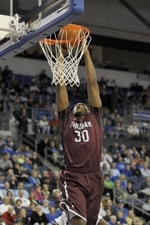 Check out the highlight below! Top 31 Moments in the UP! #23 – Watch out for Lexi Gussert! Being a sports anchor and reporter in the Upper Peninsula means you have to shoot and edit your own highlights for the evening newscasts. That means getting in a TV 6 vehicle and driving to many schools on different days. 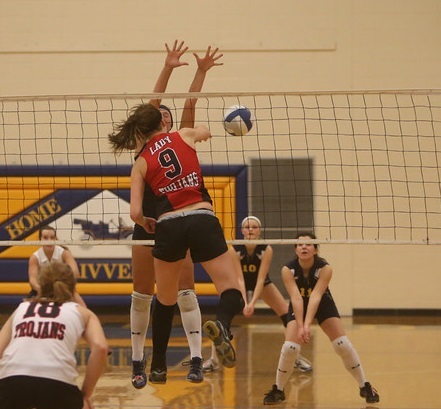 Well on November 6th, the day after election day, I went to cover some regional playoff volleyball action in Kingsford and Iron Mountain. This was the day I got to see Lexi Gussert do work on the court. People kept telling me she was amazing at basketball and was very good at volleyball too. I had to learn the hard way. In the second set against Lake Linden-Hubbell, Lexi went up for the kill and slammed it right into the hardwood floor towards me. Now the ball had so much spin that when I looked in my viewfinder, I had two options. (1. Look like a fool and get hit. or 2. Try to get out of the way and look like a fool.) I choose number 1 and well the crowd knew my consequences. Everyone in the crowd was laughing, including myself, and I posted the video on YouTube for everyone to see. There are few things you don’t forget and this was one of them. Lexi got me good and she still has another season to get another cameraman out there. It’s been a while since I have continued the countdown and it feels good to update everyone with number 24 on the list. 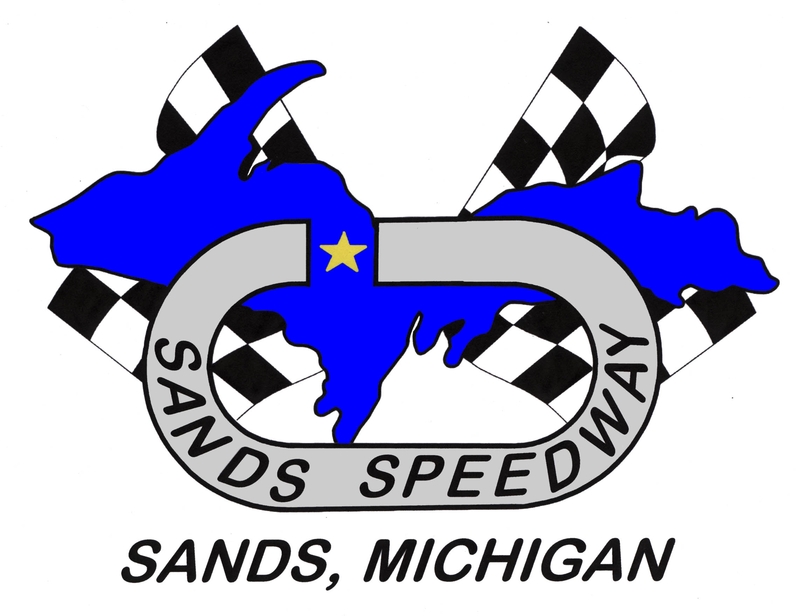 Racing of all kinds is a big sport in the Upper Peninsula and one of the local hot spots to go on a Saturday afternoon is Sands Speedway in Sands, MI. This asphalt race track may be small to a lot of people but the drivers can sure tear up some rubber and speed. The season begins in late May and runs until the end of August. The track holds races for four different types of models (Super Stock, Late Model, Pure Stock, and Mod 4) to earn a chance at winning cash prizes on heat and feature races. For more Information on the track and the recent results, click here. So now that you know all about the cars and the track, let me bring you back to September 1st 2012. It was the last day of racing at the track and the last feature race of the day. Let me put it this way, this was for all the marbles. It was the Super Stock feature race that had 16 cars on the track and it ended up being a good one. One lap around, the cars are managing well around turns and are fighting for position but the second lap took a turn for the worst. As the stakes got hot, the cars got too close to each other and that’s when the crash happened (You can watch it on the highlights down below). One of the cars in front spun out which caused the #7 car of Terry Royer to end up on top of #84 car Darryl Wirkula’s car that caused complete chaos for the rest of the drivers. Terry would continue the race after a big deal but Daryl’s car was completely totaled and he had to exit. The good news for Daryl was that he was okay and did not suffer any injuries. Later in the race, Darryl Britton lost the hood of his car and was still fighting for a top 5 finish. But Todd Yelle and Britton were neck and neck coming around a turn with only a few laps left in the race and Yelle lost control of his vehicle on the outside and then he took a tight turn around the bend and knocked into Darryl’s car taking off his front bumper which forced him to exit the race without a finish. That was insane! Two different crashes, in one race, on one day, is unheard of! In the end, Todd Yelle would end up taking home the money with a first place finish. I have never been to a NASCAR race and I have never been to a race where there was a big collision. 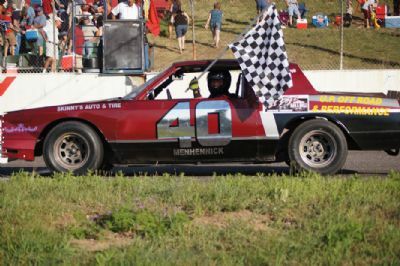 That night I was excited to go to the race track because I knew there was money on the line and that would make for good finishes toward the checkered flag. But I didn’t expect this to happen. I was so shocked when it happened I just kept my camera on the scene so I didn’t miss any of it. That’s what makes sports so great. You never know what is going to happen on any given day and with my luck I got to see something not every sports fan gets to see at the track. I am going to stick that one in the memory book and tell everyone about that crazy day at the track for a long time to come. This countdown has brought up conversations discussing multiple sports that take place during all four seasons in the Upper Peninsula. #25 in the countdown will be about a sport I did not even know existed until I showed up to Eben Junction and saw Superior Central take on Bellaire on August 31, 2012 to shoot some 8 man football. The concept is relatively simple. Instead of 11 boys playing on both sides of the ball, there are only 8 playing on offense and defense. The field is also constructed differently, The size of the playing field is often smaller in eight-man football than in eleven-man. Some teams opt for a smaller, 80-yards long by 40-yards-wide field. In terms of gameplay, eight-man football is quite different from its eleven-man counterpart. Due to a smaller field and fewer players, the tempo of the game is noticeably faster-paced. Scores tend to be higher, even in high school games where quarters are only 12 minutes long (rather than 15). Especially in high school, a higher percentage of plays are trick plays; direct snaps, Wildcat formation plays, and fake punts and field goals are somewhat more common. I had no idea what to expect from this game going into it but all I have to say is that I was extremely entertained and it was a blast to watch. I watched Rapid River, Mid Pen, Superior Central, Cedarville, and Bellaire play. Two of the best offenses that I watched were Superior Central and Rapid River. The Rockets and Cougars both averaged 37 points per a game last season. The Cougars had Trevor Maki at QB and Dan Steward at WR and that one two combo was hard to stop. 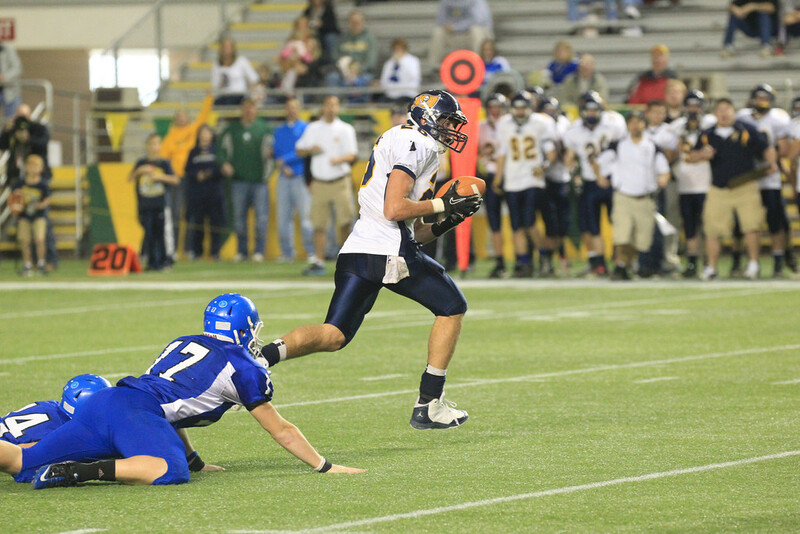 For the Rockets of Rapid River, QB Jake Pearson was unstoppable with his arm and his legs. His teammate RB Eli Orth did a fantastic job finding the end zone with his good speed and soft hands coming out of the backfield. What I loved so much about this style of football was the amazing plays that are created by the coaches and players. In the first highlight. Go to 0:30 seconds in and you will see a perfectly executed fake field goal for a two point conversion. In the second highlight, at 8:00 mark you will see a nice option by Mid Pen and then a nice long run by Rapid River to counter attack. But my favorite play of them all is when I went to see Rapid River take on Brimley on September 4th 2012. The moment takes place at the 7:30 mark in the last video. The snap to Jake Pearson on third down goes over his head about 15 yards so he has to run and recover it but what happens is he turns up field and returns it all the way to the end zone breaking tackles by all 8 players. It was sure fun to watch. Definitely one of the better ways to play the game of football. Continuing with the countdown I was doing research on the sports news in the upper peninsula and I came across an article stating that the first round of the UPLGA has been completed and all the high seeds advanced. That brought back to mind one of my favorite days during July when I saw a young 16 year old junior from Marquette Senior High School win the ULPGA Championship at Indian Lake Golf Course in Manisitque on July 18, 2012. Her name was Avery Rochester. I had never been to this golf course and I never got to watch Avery play during the High School season because I started working at TV 6 in June when the season already finished. When I got to the first tee of the championship hole I saw Avery and Polly and I thought this was going to be “David vs. Golliath” match but it was actually the opposite. After seven holes Avery was 3-up, but Anderson stormed back to win the next three holes to even the match heading to the back nine. So you thought this is when the tides were turning? That was not the case. This Redette had an immense amount of composure as she won the next four holes in a row starting on the 12th. Avery is such a fun girl who cherishes every moment and doesn’t forget anything. I wish her all the luck going to University of Missouri to play golf. She will do great as a Tiger for the next four years!